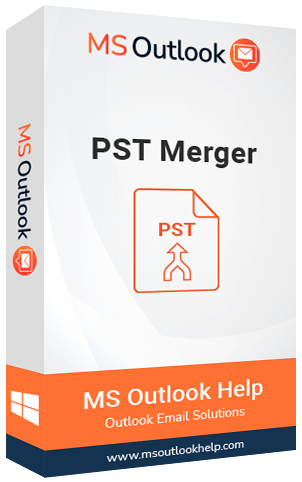 PST Merger tool helps to merge multiple Outlook PST data files and their mailbox contacts into a single consolidated file. The software enables to join PST, combine PST or merge PST and its data items like contacts, calendar, notes, journals etc. into a new single PST file maintaining data integrity without any loss. It is also featured with an option to remove duplicate items in the data files while merging PST files in Outlook. It is an effective software that enables the users to merge multiple Outlook PST files in a single PST file. It makes merger of all the Outlook PST mailbox data items into the newly created PST file. 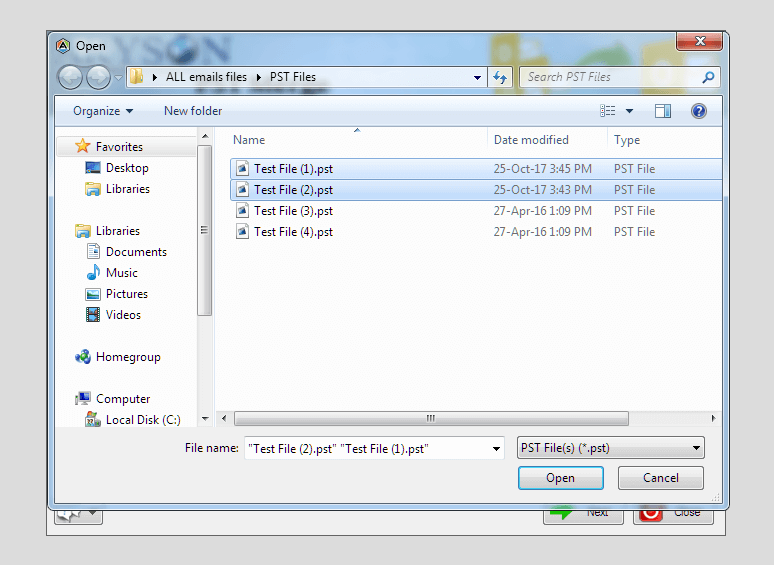 In this option, the tool creates a folder for the selected PST files and keep them intact as earlier in the newly created folder. During this process, no change in data hierarchy or any data loss occurs. This option is helpful if you wish to create a single and separate PST file for all your contacts. 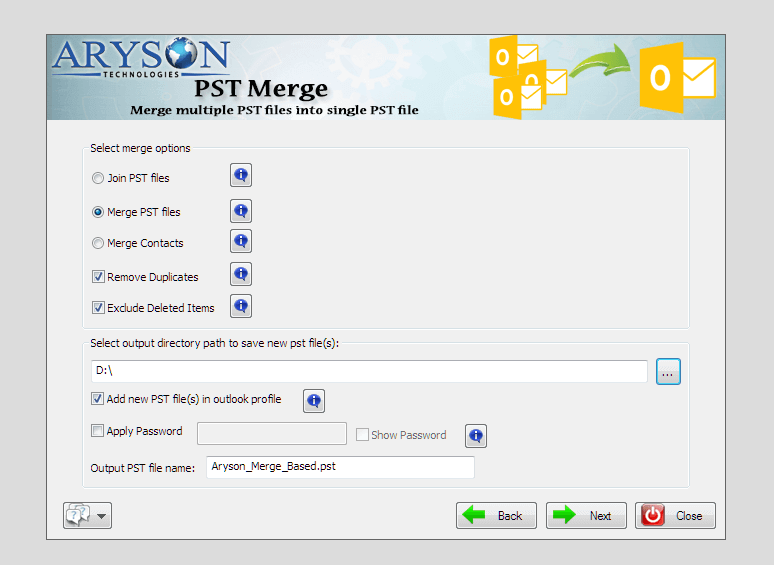 Using this option, the PST merger software allows to merge multiple contacts of PST into a new PST file. It is an useful option in this PST merge tool. Using this option, users are not only allowed to merge multiple PST files but also the duplicate items in the Outlook PST mailboxes get removed. However, this option can be used under only merge PST option. When there are too many PST files in Outlook mailbox, it becomes difficult to manage them. Using MsOutlookHelp Merge PST Software, it is easy to manage large no. of PST files. The software is provided with a feature to add security to the newly created PST files after the merger of multiple files. The resultant PST file can be protected by applying password to the PST file. Outlook PST merge software is enabled with an advanced search feature by which users can easily add new PST files by by making a search of a particular file. It is very helpful option if a user is not aware of the exact location of any specific PST file. If any user is not aware of how to merge multiple PST files in Outlook, this PST merger is the right software for that user. It doesn’t requires any prior or technical knowledge. Any non-technical user can also use it with ease. 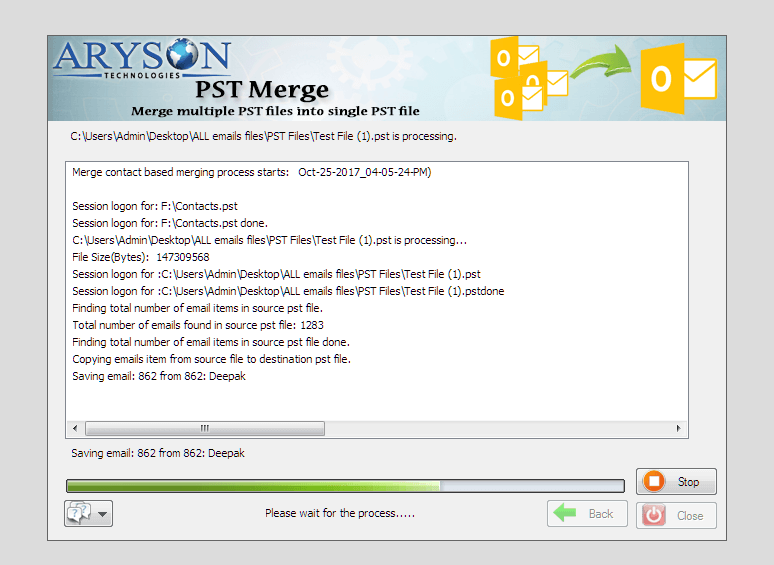 The PST merge tool supports PST files generated from all the editions of Microsoft Outlook including the current and previous ones. Also, all the versions of Windows are compatible with this software tool. Step 1: Run the software and select the multiple PST files which you wish to merge into a single PST file. Step 2: Choose one among the merge options and select a location for saving of resultant PST file. Step 3: Now, click on the checkbox of “ add new PST file(s) in Outlook profile. Also, you can secure your PST file by applying password. Click Next. Step 4: The combining of PST files is in process. Wait until it gets completed. "I used to have a large no. of PST files and it was going difficult for me to manage all these files effectively. Then, I used the merge PST software and merged multiple files into a single file which I needed the most." "The PST merge software is simple and easy to use. I am not a technical guy, still I was able to use it for merging multiple files . I’ll recommend this software to use." "I actually wanted a sophisticated software that works efficiently in less time so that I can count on integrity of data. I found this tool to meet all my expectations. " Is the installation of MS Outlook necessary before running Outlook PST merger? Yes, you need to install MS Outlook and configure it with POP3 server before the installation of this PST merge software. I have some PST files which are corrupted. Can i use all the files i.e. corrupted and normal together in one go? No, the software does not support corrupt PST files. You need to repair first the corrupted files and then use it with merger tool. Is there any limitations with the no. of PST files to be used in PST merge tool? No, you can combine as many files as you want using this software. Does this tool skip the duplicate items while merging multiple PST files in MS Outlook? Yes, the duplicate items get removed in the PST files using this software. Is the tool able to merge multiple PST files mailbox data keeping their folders separate? Yes, it can be done using “Join PST” option.